2019 - SCHOOL HOLIDAYS AVAILABLE. BOOK EARLY TO SECURE DATES. EXCELLENT REVIEWS. AMAZING SEA VIEWS. 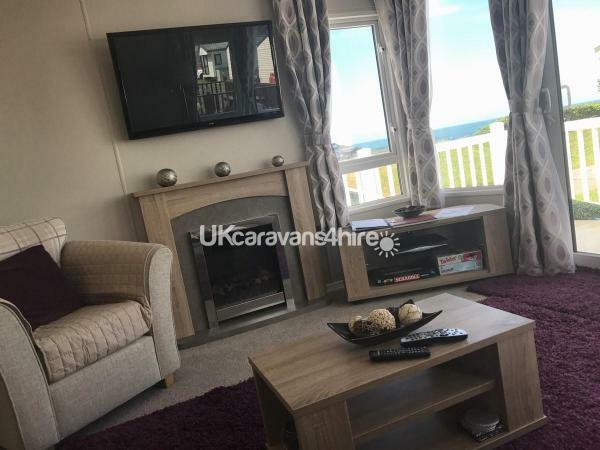 NEW LUXURY CARAVAN (CENTRAL LOCATION) WITH SEA VIEWS.... Bookings now being taken for 2019... £100 Non Refundable Deposit is needed to secure your holiday. Balance due 6 Weeks before Holiday. 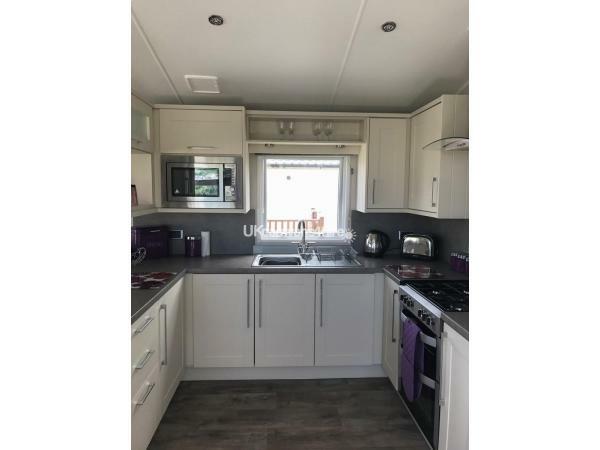 Bond of £100 must be paid with balance and this will be returned upto 2 weeks after holiday providing that the caravan is not damaged and left as you found it in a clean condition ready for the next family booking. Thank you. 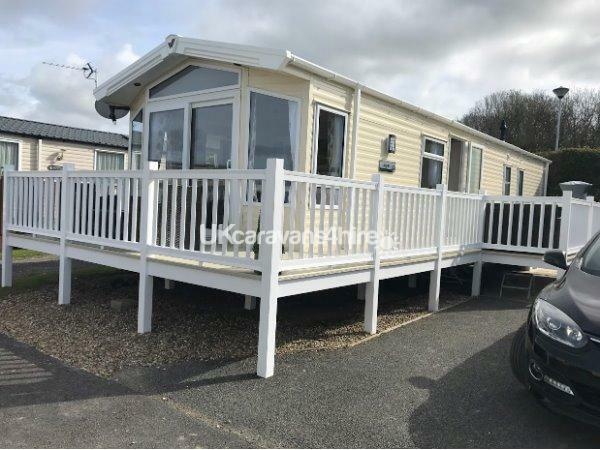 The caravan is sited on Powys with amazing SEA VIEWS/CORNER PLOT & is central to the complex right in the centre of Haven's Quay West Holiday Park, close to all the amenities and a short walk from the sandy beach. Beach can be accessed within a 5 minute walk from the caravan. 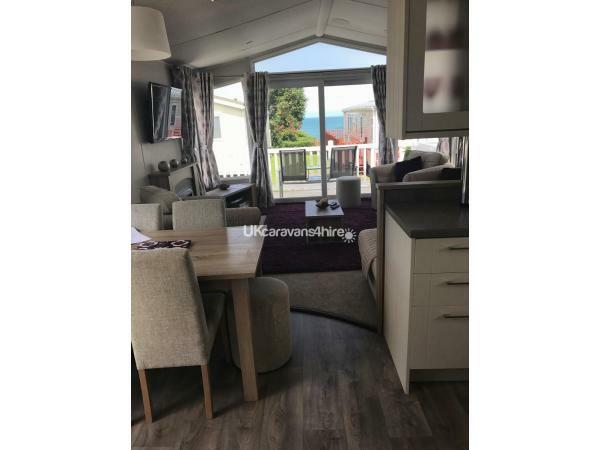 The caravan has all the usual home comforts and comes with wrap around PVC decking ideal for outside dining with a lovely sea view. The living/dining area is comfortable, enjoying the 44" TV, freeview & sky with a lovely feature gas fire. The kitchen is fully equipped with integral fridge/freezer, gas cooker, microwave, toaster, kettle, and all cooking utensils. 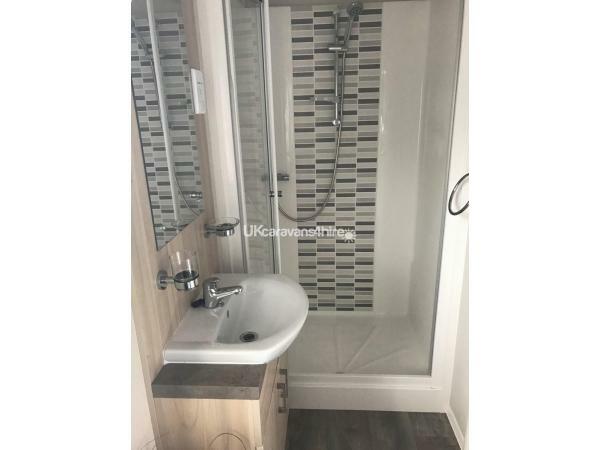 The large master bedroom has a en-suite with its own shower separate from the main bathroom, king size bed, wardrobes and dressing table area. Also benefits from having a 32" TV, Freeview & Sky making this a a comfortable luxury. The twin bedrooms have 2 single beds, wardrobe and storage. These bedrooms are also fitted with a TV/DVD & Freeview ideal for the children and comes with a playstation and games. PLEASE NOTE THAT OCCUPANCY IS ONE FAMILY BOOKINGS ONLY. All duvets and pillows are provided but bed linen, towels and tea towels are not provided. Other useful extras include iron, ironing board, DVD's including child friendly selection, children's puzzles and games. Playstation 2 console and games. The beautiful sandy beach is only a short walk away from our caravan. Entertainment/club passes are not included and can be purchased from the main reception upon your arrival. In line with Quay West's Park policies we do NOT accept all male or female group bookings from under 21's, but welcome enquiries from families and couples with NO pets. Prices are based on 7 night stay only (NO WEEKENDS). All prices shown include Gas & Electric. There is a £100 non refundable deposit payable when booking with the remaining balance to be paid no later than 6 weeks prior to your arrival. 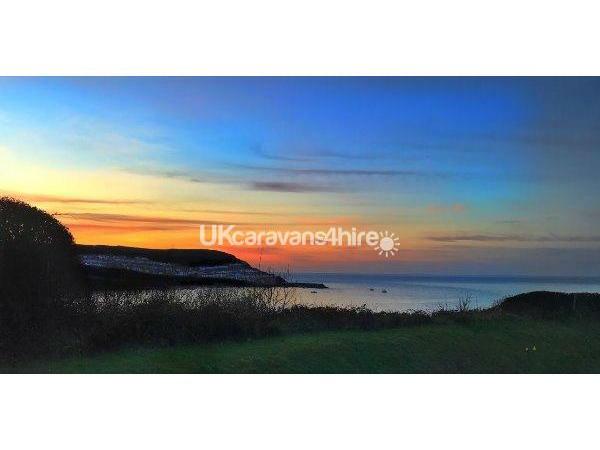 There is a Bond charge of £100 to be paid with the remaining balance, which will be returned to you up to 2 weeks after your holiday providing that there is no damage and the caravan is left as you found it and in a clean condition ready for the next family booking. Check in is 3pm, and check out is 10.00am. ON SITE LOCALLY: Archery, Bar, Beach, Nature Trail Walk, Childrens Entertainment, Childrens Pool, Fencing, Golf, Grocery Store, Laundry Facilities, Live Entertainment, Playground, Crazy Golf, Restaurant, Indoor Swimming Pool, Outdoor Heated Swimming Pool, Outdoor Splash Area with Seating leading to sea view terrace and Mash & Barrel Pub, Take Away/Snack Bar, Arcade, Tennis. What a little sanctuary this place is. So peaceful with amazing views. Sharon was great with communication. We'd highly recommend this caravan. Enjoy. We have had a great time the caravan is absolutely beautiful. 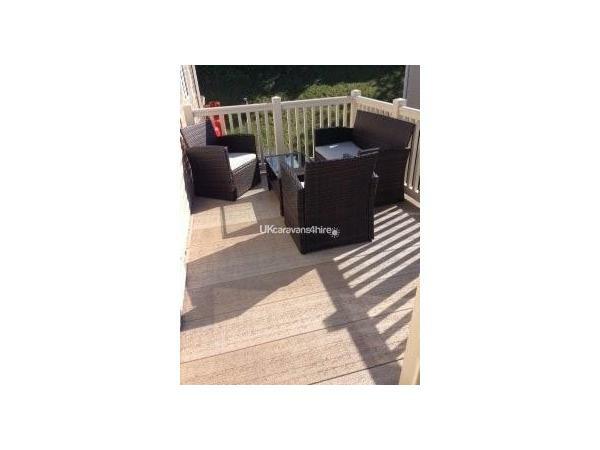 We loved the decking with the amazing views. We will definitely come back again. Without a doubt one of the best holidays we have had! I have been visiting Newquay since I was a child and the chance for my own children to stay in such a lovely holiday home was excellent. Thank you so much everything was perfect. A family of 4 and what a perfect holiday we had with excellent communication and you could not do enough for us. We loved your holiday home so much we didn't want to leave. You thought of everything and it was just amazing will definitely book again with you. thank you so much lovely holiday and enjoyed the bottle of wine many thanks. Everything we could possibly need and more. Fantastic week in this beautiful caravan. Sharon was always quick to get back to us with any questions and we had an excellent experience of booking direct. Our 2nd stay with you in your lovely caravan. 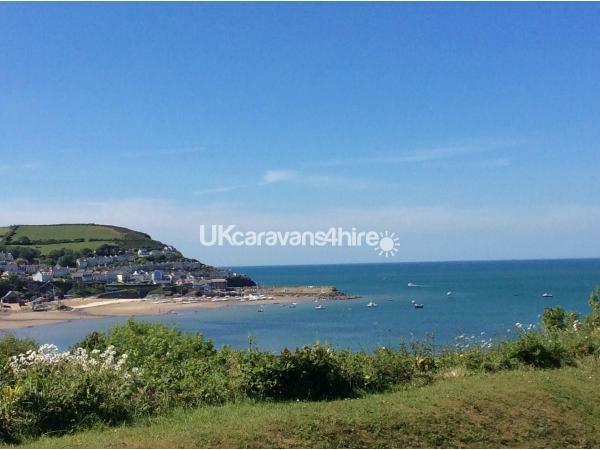 Loved New Quay and the surrounding area and the caravan had everything you could wish for. Thank you so much once again. Weather was a mixture. Loved the caravan with your beautiful views which were the best we have had when staying on this site. Couldn't ask for any more and excellent stay. Thank you. WOW what a van really lovely and the weather was brilliant as well. Lovely view of the harbour from you brand new caravan which you informed us you had upgraded early this year. We were so lucky with the weather and will miss the view when we wake up in our house! Thank you so much already booked up for 2018. Thank you so much for allowing us to stay at your holiday home we had a fantastic time and cant wait to come back. Stunning caravan thank you so much it has been excellent with fantastic communication with you even when you were in spain yourself! Would love to come back. Excellent stay at this caravan! Sharon was a delight to deal with and we thoroughly enjoyed what the beautiful place had to offer. The caravan was spacious, clean and very modern. The view was great and the location perfect. We would not hesitate to book again. 2 weeks stay at this lovely holiday home and it was excellent from start to finish. excellent communication with the owners who were friendly and accommodating with every request. 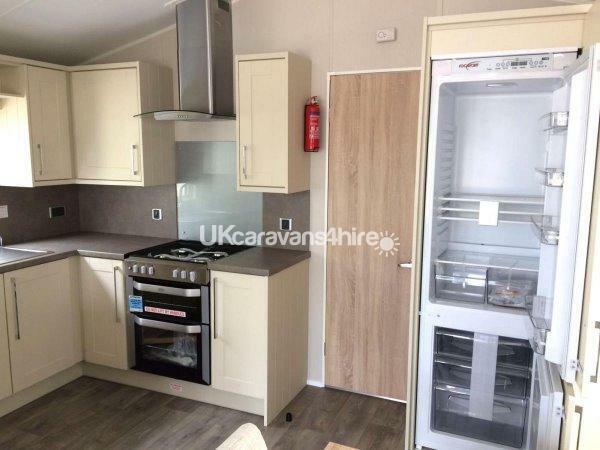 Luxury caravan and photographs do not do this caravan justice. Exceeded my expectations and wouldn't hesitate in re-booking again in the future. Booked August bank holiday with an early check in day offered. My husband, daughter & partner stayed here and thoroughly enjoyed our stay. 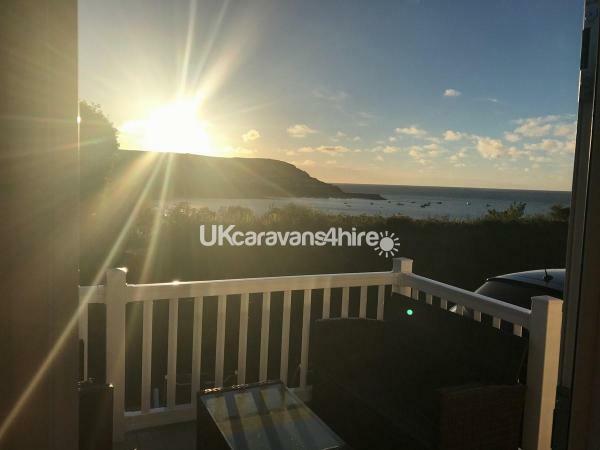 The caravan was excellent and in a lovely location enjoying a fantastic view. We explored the area and would definitely recommend. Communication was excellent and we had a wonderful stay. Thank you for our welcome greeting and bottle of wine too!. Thank you for the review and sorry we were unable to re-book you for the following year for August bank holiday. Please let us know if there are any other dates we can help you with instead. Look forward to welcoming you back in 2016. Lovely caravan on a great site. The area around is easy to access with walks, beaches and restaurants. Really enjoyed our stay and communication with the owners is excellent. "Had a lovely time, thank you for making us feel so welcome. Booked again for next year. 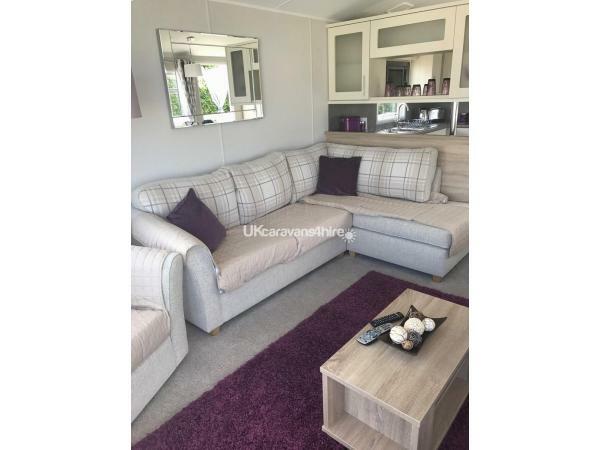 Thanks"
"Thank you for a lovely stay, caravan is a luxury modern home and my grandchildren loved having the playstation during wet days. You made the booking really easy and we look forward to coming back 2013!! Thank you." 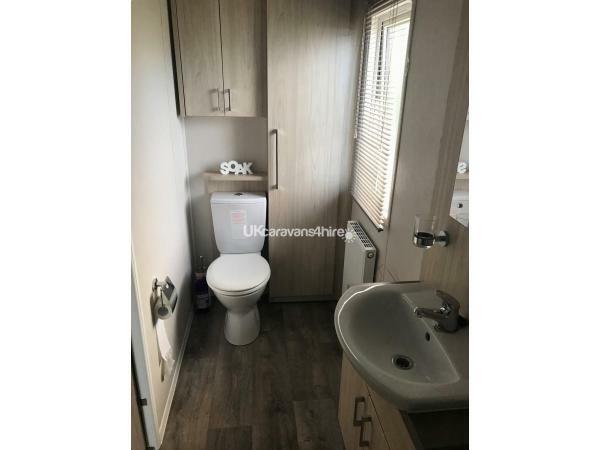 "Caravan was great, very modern & spotless. Real treat having luxuries sky tv & tvs in bedrooms, play station & iPod dock. Had a relaxing holiday enjoying the lovely veranda too! Excellent communication with the owners, no problems, bond returned promptly & would definitely re-book again." "Loved your trendy caravan in 2012 and looking forward to booking your new caravan next year. Made us feel so at home and the kids loved the caravan."